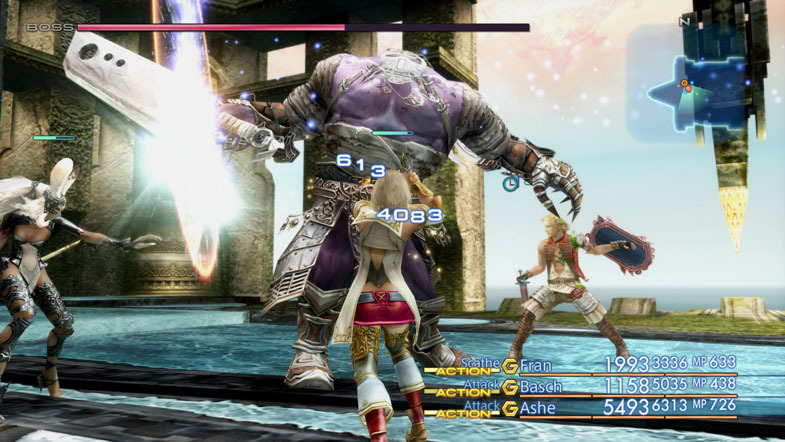 Final Fantasy XII: The Zodiac Age is an RPG situated at the outset in a city surrounded by a desert wasteland. Originally released for the PS2 in 2006, the PC release sees several additions and improvements. The most drastic change is the job system. The PS2 release (except for the Japanese version) did not have this feature. Other new additions include the option to change speed, trial mode, and an updated map system. You may change the speed of the game to double or even quadruple. This greatly lessens the time to reach a destination and makes battles fly. Quadruple speed might prove problematic in battles unless you keep a close eye on your characters’ health. With the updated map system, you may bring up a map of the area to overlay onto the field. In the previous edition, you could only access the area map within the menu. Gameplay begins with a tutorial covering movement, camera control, and combat. You play as Reks for this part, after which you find yourself in the City of Rabanastre as Vaan, Reks’ stubborn brother. Your first real combat task is to accept a hunt for the Rogue Tomato from the board in the tavern, where you find notices for hunts. Defeating the monster and submitting completion of the hunt yields a reward. Completing these helps increase your clan rank. Early in the story you can choose a job for Vaan or wait until later. You can see the strengths and weaknesses of each character better if you play with them before choosing their jobs, but the decision remains yours. I advise looking at a job guide but choose a setup that coincides with your preferred playstyle. The implementation of the job system prevents you from having complete freedom of customizing your character compared to the PS2 version. There are twelve jobs from which to choose — but certain jobs overlap others. For instance, the Black Mage, Uhlan, and Red Battlemage jobs all permit you to equip black magick spells. The Black Mage has the most variety of black magick spells available (licenses one through thirteen), with Uhlan having access only to black magick licenses five through seven. You gain LP (license points) to purchase licenses on these boards and develop your character’s job. The majority of the licenses permit access to types of equipment, spells, or gambit slots. Gambits, which you unlock later, help you automate your strategy in battle. An essential one is attacking the closest foe. It’s also nice to have one geared toward survivability, such as curing an ally whose health is below thirty percent. You unlock a gambit shop in Rabanastre later where you may purchase additional gambits for more versatility in your setup. Except for choosing a mage type, it does not seem to matter much initially which job you choose for your first two characters. There's not much you can buy early on that you could use, either because the shop doesn't have equipment or magick you have a license for or because you have yet to purchase a license permitting use of the item. Before I bought anything from a shop, I already had the first three Light Armor licenses. The shop had equipment that required only the second Light Armor license. I do recommend purchasing a black magick spell and cure if you know that you’ll make a character a mage soon. If you plan for when you might need and use something, you may cut down on grinding later. Unlike equipment where you have to buy the item for each character, you need only buy a spell once. Any character that can use it has access to it. You have freedom here to either progress the storyline and encounter bosses and new characters to play or roam around in the regions currently available: Dalmasca Estersand, Dalmasca Westersand, and Giza Plains. If you’re the type that prefers grinding, you might want to do so now or at least before you enter the Palace after the Waterway — the enemies in the Barheim Passage prove perilous if you’re not prepared. If you lose track of where to head next, dialogue and your map will indicate your destination. Compared to the Giza Plains, most of the enemies you find in the Garamsythe Waterway are easier. But, you might have to face more at once. Without Penelo in your party, potions prove handy for when your HP inevitably gets low. You may want to invest LP into your License Board and browse shops for better equipment, particularly since you must make your way to the Royal Palace from this Waterway and you’re stuck in the Palace until you complete your mission there. The game advises you here to save to a new file for this reason. At the Palace, you only need to solve a short stealth-styled puzzle. If a guard sees you, you return to the beginning of the room. While you’re obtaining the Goddess’ Magicite, two characters (Balthier and Fran) confront you and demand it back. A cutscene reveals that the Palace is under attack; Balthier and Fran flee on a flying bike and kidnap you. The bike crashes, and you find yourself back in the Waterway with them in your party now. I chose the Time Battlemage job for Balthier and the Red Battlemage job for Fran. The access to both fire and cure spells for Fran is handy here for the giant toads. Only time will tell if these choices are prudent ones come endgame, given that these choices are permanent. You cannot change a character’s job, but you unlock a second job for your characters later. You could, if you wanted to test other builds, remain jobless until you obtain at least a few characters and then save this as a new file and use it as a template. There are a few tougher battles in the Waterway after you leave the Palace: You must face giant Flan creatures and a Firemane. The fire spell makes quick work of the former; the Firemane poses a better fight, but one that is nearly trivial still even with minimal grinding. You should have a surplus of potions and antidotes for this one. Guards surround you after this fight and throw you in the dungeon. You find yourself alone once again, but only momentarily. In the next area, search around for treasure boxes for equipment and items. There is no option to save at this point, however your health relies on available mana (assuming access to the cure spell) and potions. At the beginning of Barheim Passage there is a vendor should you need to stock up on supplies. Unless you have been grinding for LP to fill your license boards and purchased particular licenses, you likely won’t have use for much of the equipment save for just a couple of pieces. Make your way through here and fight the foe that awaits you at the end of the passage to reclaim your freedom and emerge in the Dalmasca Estersand. Take the time to grind if you feel the need. Purchase items from the shops, and even take on a hunt or two before embarking on the next adventure to the skycity of Bhujerba. This new area and its lush greenery you see as you arrive stands in heavy contrast to the barren wastelands surrounding Rabanastre. 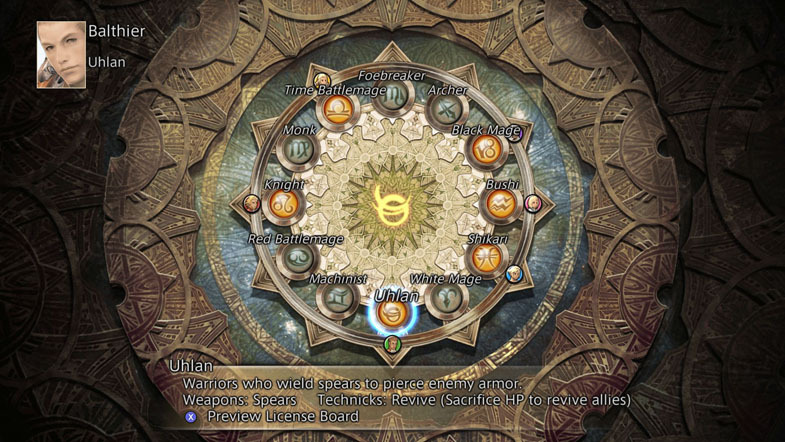 As Balthier notes before you leave Rabanastre, it might be awhile until you return so now is the time to ensure you’re ready (there are a few shops in this city, however). After my PS2 stopped being reliable, I pined for a way to play this title once again. The added features and no problems make this an excellent release. A player might dislike the job system with no option to turn it off, although it ensures how you build your characters will have more impact (though this is hard to tell at first).